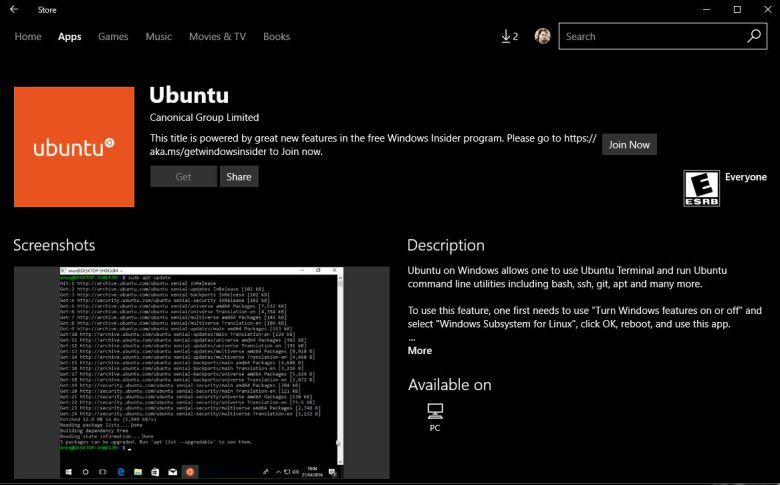 Ubuntu is available in Windows App Store. Ubuntu on Windows allows one to use Ubuntu Terminal and run Ubuntu command line utilities including bash, ssh, git, apt and much more. To use Ubuntu, one first needs to install Windows Subsystem for Linux. Once you’re done simply use “ubuntu” command in cmd.exe or launch Ubuntu from the start menu. Run multiple distro’s simultaneously: Not only can you install distro’s side-by-side, but you can now run more than one distro simultaneously. With Ubuntu, users will able to run Linux and Windows applications side-by-side on their PCs without dual-booting. However, only Windows 10 Insider Preview build 16190 or newer can install Ubuntu from the Windows Store. Last month, SUSE Linux Enterprise Server and openSUSE Leap also made their way to the Windows Store for Insiders. Currently, Ubuntu build 16.04 LTS 20170619.1 available in the store. You can download it from here.